Beard algae are also referred to as black pointed algae or red algae. In fact a fluffy tuft of algae is involved in the form of a beard, which explains the name. 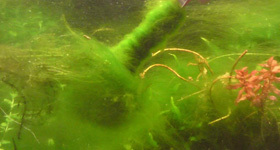 In some cases the algae will form longer strings. In many cases the algae will form owing to a poor or unstable CO2 content. A constant supply of CO2 is the magic word for the destruction of beard algae. Beard algae have to be fought seriously, because it is difficult to remove them from pond plants. They are formed as a result of a too low or unstable CO2 content. We have gathered a number of causes for beard algae and tips to fight them. Less sunlight, sunlight cause undesired algal growth. Too poor or unstable CO2 content: CO2 is food for your plants. Properly growing plants take care that algae get a poorer chance. Increasing the CO2 value or rendering it more stable may help to take the cause away. Bad flow: bad flowing will enable algae more easily to adhere and grow. You should see to it that the flowing will pass through the entire pond. Too many fish: feeding your fish is also a burden for the equilibrium in your pond. Both the defecation of fish and the remaining feed are in fact feed for the algae. You need not feed your fish every day.